​Dave Kuniega feels like a chemist living in an engineer's world. 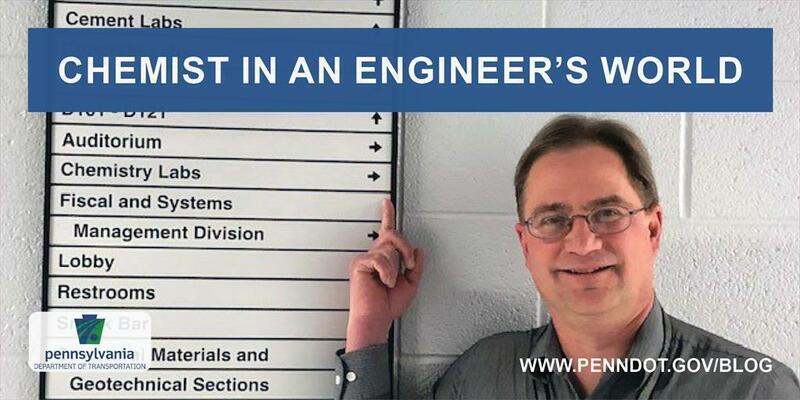 Which is fairly accurate since he is the chief chemist and manager of Chemistry, Instrumental and Physical Testing Sections at the Pennsylvania Department of Transportation's materials testing lab. Most people don't realize the extent of checks and balances when it comes to what PennDOT uses or does. A simple bag of rocks goes through so much testing. Who knew? There are specifications and standards for most everything used. This includes testing to define a material and its properties. These standards are not just for the state, but nationally and internationally as well. Kuniega was able to break his area down into two main parts: physical properties (i.e., dimensions, strength, durability) and the chemistry lab that reviews the composition properties (i.e. What do I need to make sure it survives?). He explained that his team's job is to test materials "… to make sure it works the way it is intended and specifically to last the way it is intended. It is a challenge." PennDOT even has specific standards for distinct parts of the state. "You don't need the same material if you don't have the same weather," Kuniega explained. While PennDOT may have to replace a bridge in 50 years, Kuniega is testing materials to see if he can build a bridge to last a century. At the lab, they will test several types of steel, admixtures into concrete, or work with de-icers and paint formulas. Maintenance will direct them to review a few products such as beet brine vs. salt (or other agricultural products). Often companies will provide the materials needed to test them. "There is such a variety and many challenges," Kuniega said. They test everything imaginable, in some fashion, before it is used. They first must approve the materials. Then samples that have been approved are tested before they can be used. Next, the material is monitored while in use. Finally, the lab team will check back to see if it fails. If it does fail, they ask why? What can they do differently to improve it? Kuniega is well known in the industry for "pavement markings." That is his niche. The yellow or white stripes on Pennsylvania roads are repainted every three years or so. Two million gallons of traffic paint is used each year. Kuniega is testing reflective properties — placing glass beads in the paint to make them glisten or reflect light at night. He is moving this idea into a new direction as he is working on markings to help direct autonomous vehicles. With all his knowledge of biology, physics, and chemistry, what is the question he is most frequently asked? "When people learn that I work in the PennDOT lab, the first thing they ask me is, 'How do I get line paint off my car?'" Kuniega said with a smile.